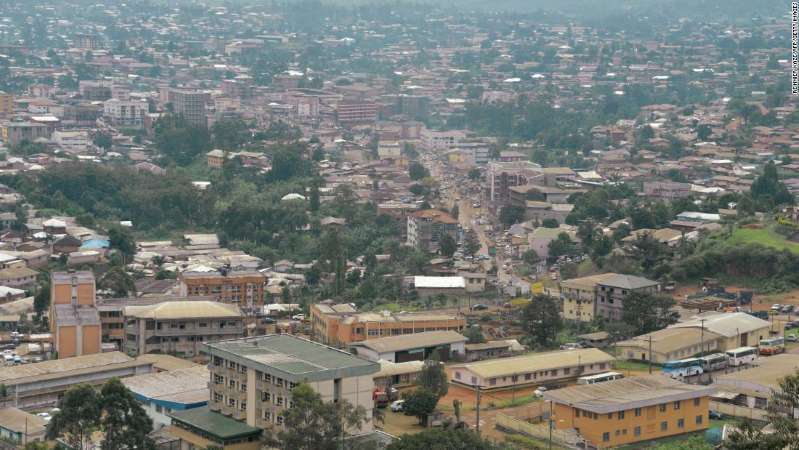 © REINNIER KAZE/AFP/Getty Images A photo take in June 2017 shows the city of Bamenda, in Northwest Cameroon. Cameroon's northwest authorities suspended the movement of all non-emergency vehicles in the area where they say 79 school children were abducted early Monday. The restrictions began Tuesday in some districts in Bamenda to facilitate search and rescue operations for the abducted school children, according to local authorities. The pupils were taken around midnight Monday along with their teacher, the principal and a driver from their boarding school, the Presbyterian Secondary School in Bamenda city, authorities told CNN. Monday, the army deployed military police and helicopters to search for the children. Though no one has claimed responsibility for the students' abduction, authorities did not rule out the involvement of secessionists fighters, who are waging war in Cameroon's English-speaking provinces. He described Monday's kidnapping as a "mass distraction tactic" by President Paul Biya's government to divert international and local attention from the President's inauguration. He said members of the separatist group had been ordered to search communities in the region to uncover the kidnappers' hideout. CNN is unable to immediately reach the government for comments on Tanku's allegations. He called for peace in the country's troubled Anglophone regions during his inauguration in the country's parliament. He, did not, however, address the school children's abduction, according to local media reports. Kidnapping incidents have increased this year in Cameroon's volatile Anglophone regions by armed separatist groups calling for a secession of those areas, according to Amnesty International. Amnesty International said in a September report that it had recorded 260 security incidents this year, including the kidnappings of civilians and violence between Cameroon's soldiers and armed Anglophone separatists. Rights groups have accused the 85-year-old leader of presiding over a brutal regime, marred by human rights abuses, particularly toward residents and armed separatists in Cameroon's English-speaking provinces. Armed separatists also face allegations of killing and kidnapping civilians and soldiers. Volatility in Cameroon's Anglophone provinces is nothing new. Cameroonians in the northwest and southwest provinces make up about 20% of the country's population, but they say that the mostly French-speaking government has marginalized them. The Anglophone problem, as it is sometimes called, is a legacy of West Africa's colonial past. Germany claimed the region prior to World War I, but after losing the war the territories were split and "given" to the English and French governments. The nation that become Cameroon was an awkward amalgamation of those two colonies. The current unrest escalated in late 2016 after lawyers, teachers and students went on strike and held street demonstrations about what they said was continued discrimination against Anglophones. The strikes and boycotts led to a severe crackdown by police and soldiers, say groups like Amnesty International and Human Rights Watch. These groups and local activists say that scores of villages have been burned and civilians killed by the government actions. The government maintains it is just trying to maintain law and order. In this spiral of violence, armed separatists have formed and killed scores of military and police in the ensuing fighting -- often using hit-and-run tactics. Some observers say the President is out of touch with the situation on the ground. The President spends a large amount of his time out of the country. Biya has condemned "acts of violence," regardless of their sources.